Conjunction Junction, what's your function? Anyone? This is my sister's Christmas quilt. Laying on my king-size bed. It's enormous. I had to return my mom's sewing machine for a few days and was unable to finish it in time for Christmas morning, so she opened a basted quilt. Starting Christmas Day I got knocked out by the almost-flu and could barely stand for about 5 days. Once I wasn't as weak as a baby chicken [are they weak? I don't actually know...] and I got the machine back I quilted like a madwoman, trying to finish it before she left for school again. Alas, I ran out of white thread on the night before she left with just that space under and slightly to the right of the blue X remaining to quilt. Believe you me, I've been parked at Frustration Station for most of the making of this quilt. Positive note? My cat loves it. I love the way you have arranged the hsts - striking on the white background. Glad you're feeling better! The quilting looks fantastic, too! :( Sorry you had to deal with all of that - it does look awesome though!!! What a shame Rebecca, it looks great though so will definitely be worth the wait! So frustrating. Did you mind go numb quilting all that white on white? Oh Rebecca - it is beautiful! With all that you been through believe me when I tell you the quilt is gorgeous! Oh seriously, baby chicks are full Of spit and vinegar! In less than 20 minutes they are climbing all over mama and after a few hours she is making herself crazy trying to keep track of all of them! I lOve your quilt! 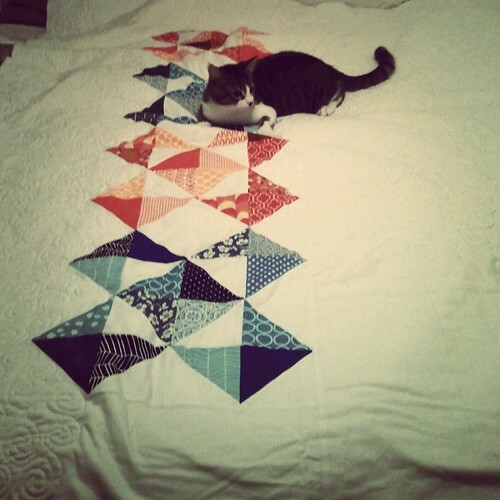 Your quilting is nice. Be brave! Quilt on white with a muted thread colOr!